As per the sources, the dust storms that struck the areas of Jaipur and Alwar in Rajasthan have wrecked havoc and have killed around 27 people and more than 100 are injured. The cities have witnessed the mass destruction and the storm has uprooted hundreds of trees from the area. The districts of Bharatpur and Dholpur too witnessed the dust storms and nine people lost their lives in Bharatpur. In Karauli area, the wall of a building collapsed and two women were seriously injured. Later they were taken to the nearest hospital. Jhunjhunu reported the death of two women due to the dust storm and further the incidents of fire from Dholpur is the cause of worry for the district administration. Their scene of the Alwar district was very dreadful as the whole district was darkened due to the dust storm as the electricity department had to cut electricity noticing the fall of the electric poles on the roads. A 25-year-old Rakesh Jangid succumbed injuries when he was trapped by a fallen tree in Alwar. He was a resident of the Bharkheda area of the district. At least 20 people suffered injuries and they were taken to the Rajiv Gandhi Hospital for treatment. Rescue teams have reached the site and are doing their job. The team has already alerted the health officials so that right treatment can be provided to the needy people. Dust Storm has caused many injuries in the districts and the environment of the whole state has turned dreadful for now. 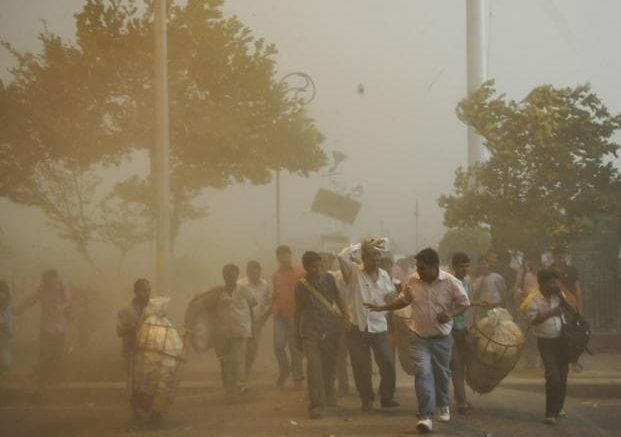 Be the first to comment on "Dust Storm Wreaks Havoc in Three Rajasthan Districts, Kills 27 People"